Product prices and availability are accurate as of 2019-04-03 09:56:42 EDT and are subject to change. Any price and availability information displayed on http://www.amazon.com/ at the time of purchase will apply to the purchase of this product. This Koncept UCX-42-W-MBK-1PK UCX metallic black under cabinet light has an aluminum housing for light weight and resistance to corrosion and produces 80 foot-candles (fc) of brightness with 11W of power consumption from 42 LEDs. It produces light with a warm color temperature of 3,500 Kelvin (K), and has a built-in touch strip dimmer with multiple dimming levels for adjusting light intensity. This light fixture can be mounted with magnets or screws (both included) and swiveled up to 60 degrees for optimally directed lighting. Up to four fixtures can be chained together and controlled individually or synched with a daisy chain cord or connector (not included). 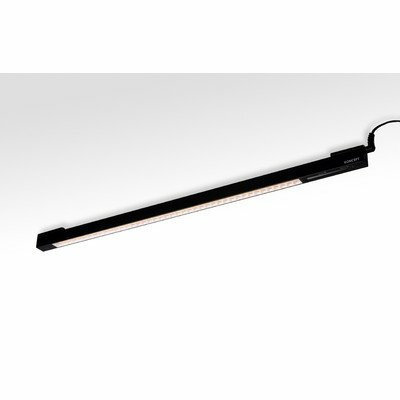 This under cabinet light is suitable for a range of indoor lighting applications. Brightness 80 fc at 18"
*L is length, the horizontal distance from left to right; H is height, the vertical distance from bottom to top; D is depth, the horizontal distance from front to back. Koncept manufactures LED lighting fixtures for home and office. The company, founded in 2002, is headquartered in Monrovia, CA.